It's easy to shoot great- looking video on your iPhone®. By buying this product you'll earn up to 300 Rewards points. 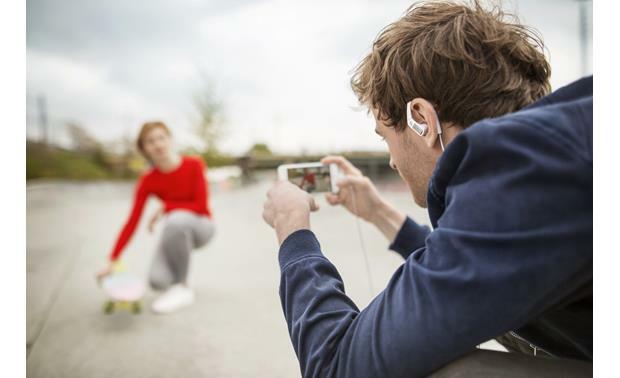 It's easy to shoot great-looking video on your iPhone®. But the sound it captures is pretty flat and one-dimensional. 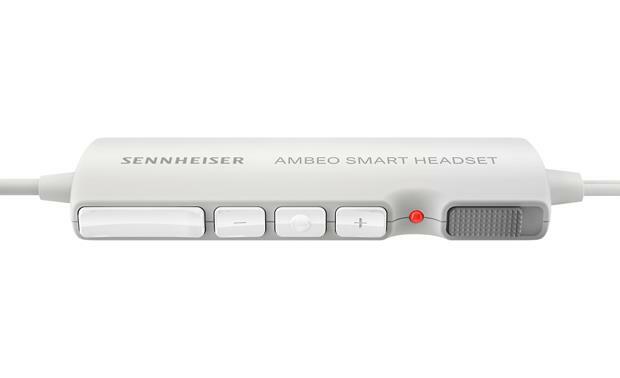 The Sennheiser Ambeo Smart Headset makes realistic 360° audio recording as easy as donning some earbuds. Omnidirectional microphones positioned in each earpiece capture the sound all around you in relation to each other, exactly as your ears would. 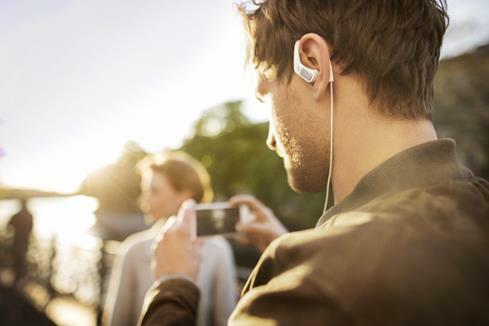 Adding immersive sound to your videos with the Sennheiser Ambeo Smart Headset is as simple as pointing your iPhone. Say you take a video walking down a sidewalk, passing a street musician on your right. During playback, the music will get louder, pass by your right ear, then seem to get softer — all in sync with your video. That's what the Ambeo Smart Headset can do. Using this headset could hardly be easier. Just make sure your head is pointed at what you want to record, and the headphones take care of the rest. Your iPhone's Lightning connector supplies power to the microphones. An in-line controller lets you adjust volume, with a slider to set the sensitivity. Set it high for a quiet walk in the park, or low for a live concert. Built-in Apogee mic preamps and Soft Limit software give your recordings natural sound. Precision-tuned analog-to-digital and digital-to-analog converters deliver clear, clean details. You'll get true binaural recordings that you can play back and enjoy on any stereo headphones or speakers, or even your home theater system. The Ambeo Smart Headset isn't just for vloggers and filmmakers. When you're not recording, they make a great set of noise-canceling headphones. Use the slider to adjust the noise cancellation level. You can completely block out ambient noise. Or let some in if you need to stay aware of your surroundings. And you can make hands-free calls with the Ambeo Smart Headset, too. 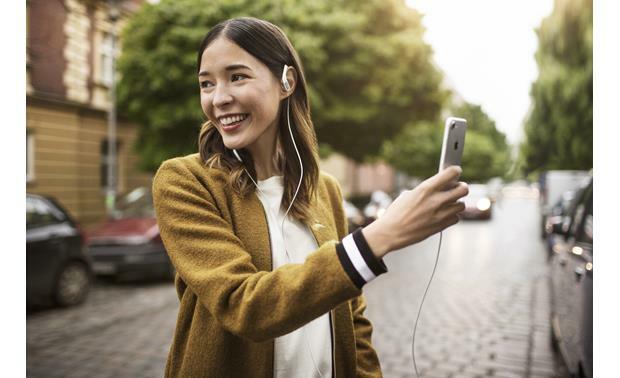 Researched by Crutchfield's Mark G.
Overview: The Sennheiser Ambeo Smart Headset is designed specifically for Apple iOS devices (iPhone, iPad, and iPod touch). Instead of a standard 3.5mm plug, the Ambeo has an Apple Lightning connector. Unlike traditional headphones, the Ambeo Smart Headset helps you capture 3-dimensional audio for videos you shoot with your iPhone or iPad. Three pairs of silicone ear tips and a storage pouch are included with the headphones. Ambeo Smart Headset App: To further enhance your experience the Ambeo Smart Headset app provides additional features and custom settings through your iPhone or iPad. Situational Awareness: Using the app, you can control the amount of ambient noise you can hear through the headphones. If you want some ambient noise to be heard, you can choose Natural Level, Amplify Level, or Reduce Level. 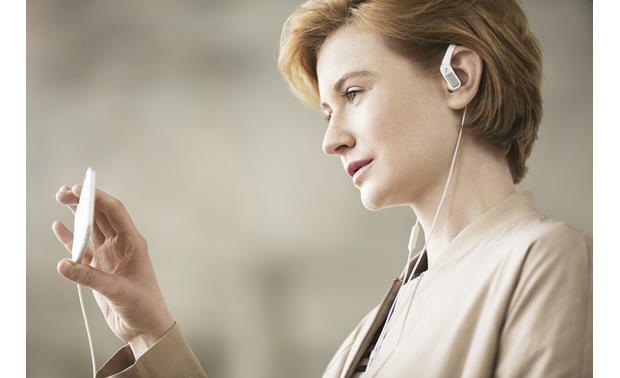 If you want to block out ambient noise, you can turn on Active Noise Cancellation (ANC). Situational Awareness can also be turned off, if desired. Recording Level: If you are using the built-in 3D microphones in a recording, you can set the recording level of the mics. Options include Natural Level to record the general surroundings, or Reduce Level to record loud events, such as concerts. Playback EQ: You can set the equalization of the playback audio through the app. There are five presets to choose from: Flat, Bass, Hi-Fi, Spoken, and Custom (3 parametric bands adjustable from -10dB to +10dB). 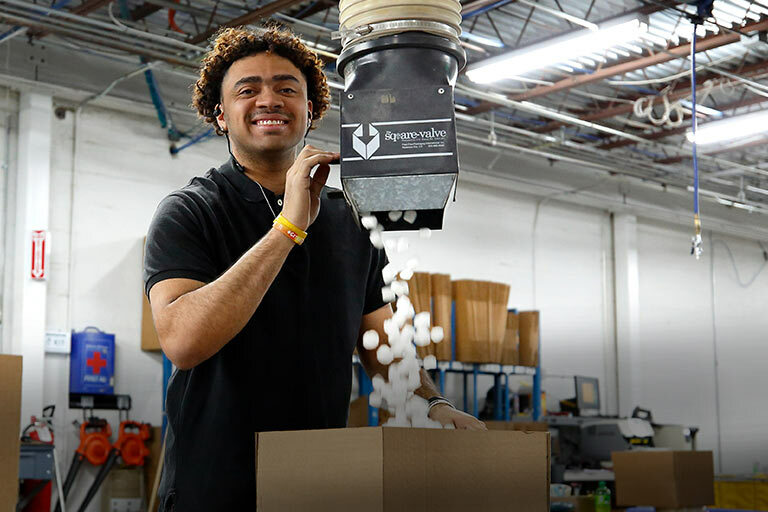 Voice Prompts: The app lets you enable Voice Prompts to give you audible confirmation of setting changes made with the rocker switch and smart slider on the control module. Quick Start and Updates: The app also includes a copy of the Quick Start Guide for quick reference. Notification of firmware updates are also provided by the app to keep your Smart Headset up-to-date. Powered by Apogee: The Ambeo Smart Headset is equipped with high-quality microphones on each ear piece for recording a 3-dimensional audio track for the videos you shoot with your iPhone or iPad. The microphones pick up sound just like your ears do, because they are positioned at each ear. This immersive, 3D sound experience can be reproduced with any headphone on a stereo playback device. The headset features Apogee's proprietary Soft Limit and mic preamp for high quality audio from the microphones. The headset bypasses the iPhone/iPad's built-in A/D and D/A converters and applies a more precisely tuned converter for recording and playback purposes. 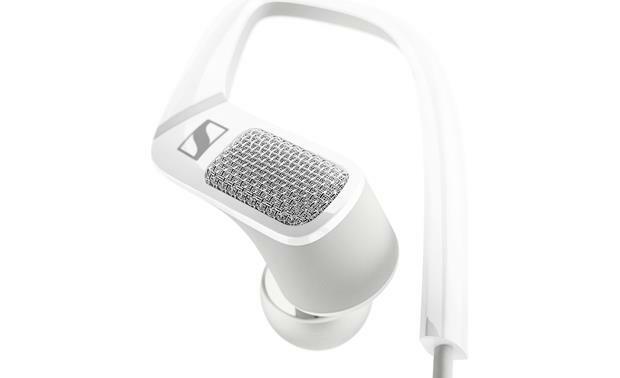 Design: The Sennheiser Ambeo Smart Headset features a unique ear hook design that helps keep the ear buds in place, and reduces structure-borne noise. Three pairs of silicone ear tips are included for proper fit. Control Module: The in-line Control Module has three buttons for music and phone call management (Volume Up, Volume Down, Multi-function button) for compatible iOS devices. A 3-way rocker switch on the module lets you select the Situational Awareness and Active Noise Cancellation features. A spring-loaded Smart Slider is user-assignable for launching the Apple Camera, Apogee MetaRecorder, FilmicPro, Voice Memos, and Smart Headset Control. You can also choose Toggle Interact, Toggle 3D Mic Recording Level, and Mute Telephone Mic. The dimensions of the module are 2.846" length, 0.863" height, 0.354" thickness. 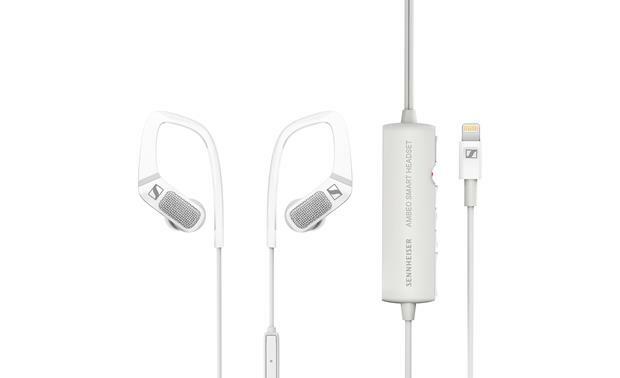 Searches related to the Sennheiser Ambeo Smart Headset Mobile recording headset with Lightning® connector.